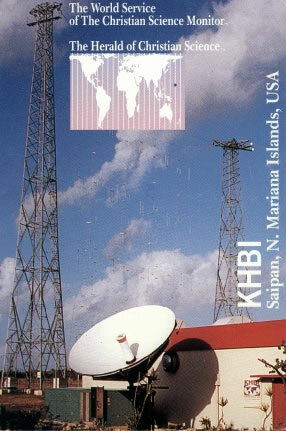 KYOI, located on Saipan in the Northern Mariana Islands was a commercial shortwave station, on air 24 hours a day, broadcasting “Contemporary Hits” rock music directed at the Japanese market. 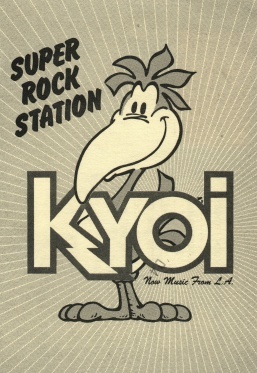 Superock KYOI was first heard testing on December 17 1982. Initial frequencies were 11900, 15190, 15405, and 9670kHz. 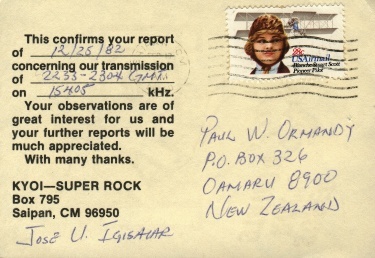 The station was very well received in New Zealand, despite being off the ‘back of the beam’ and I for one enjoyed their music and frequently had KYOI playing in the back-ground. The station was the brainchild of Lawrence Berger, who also owned KHVH-AM Honolulu, KUAM AM-FM Agana, Guam and WVUV-AM Pago Pago, American Samoa and who held a 50% shareholding in KYOI operator, MARCOM. 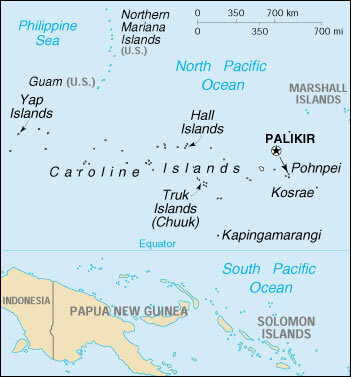 The other owners were Fred Zeder (25%), then the Ambassador for Micronesia political status negotiations, and Adrian Perry (25%) the former President of Kentron Hawaii Limited (operators of WXLE Canton Island in the early 1970s). Super-Rock KYOI had a carefully selected name – “Super” having a very strong, positive meaning in Japan, and “YOI” meaning “good” in Japanese. From its two 170 foot towers reaching into Pacific skies, the latest in rock music was beamed to a young Japanese audience of 18 to 30 year-olds from one end of Japan to the other. Major advertisers supporting the station and its programs were Seiko, Sony, Continental/Air Micronesia and a Japanese magazine. KYOI received thousands of letters and reception reports, and acknowledged all reports with cards postmarked “Saipan CM”. The station also hoped to encourage interest in Saipan as a vacation spot. SuperRock KYOI was located on about 8 acres of land in southern Saipan, at a place with the name of Agingan Point. Both studio and transmitter facilities were co-sited in the same building, a 2000 square foot concrete structure designed to withstand hurricane winds of 150 mph and strength 3 earthquakes. The entire plant was self sufficient, with its own 450 kW diesel generator and a 2500 gallon water catchment system with filtering unit and compression tank. In the event of a typhoon, KYOI could remain on air indefinitely. And typhoons caused minor typhoon damage in December 1986, and severe problems in being knocked off the air in October 1987, returning with ‘shocking’ audio for a period. The transmitter was a Continental 418-D-2, 100kW high level plate modulated, with an automatic servo system, allowing pre tuning of channels in use. Three tubes sat in tanks of distilled water that boiled off into steam and then condensed back into water to be returned to the system. The antenna system consisted of a complex and elaborate array, comprising 16 dipoles phased together directed towards an azimuth of 340 degrees true. The curtain and screen system designed to withstand 150 mph typhoon winds. A computer system was used to change frequency 4 times daily, completely eliminating operator error. The music was run from a program automation system, which held up to 7 days of 24 hour programming. A time clock was incorporated allowing station IDs and frequency change announcements to be aired at predetermined times. Music, commercials and jingles were all called up from a series of carts by the computer system. From what was a jungle of brush, the sound of Superock KYOI beamed out from state of the art facilities to listeners around the world. After almost 3 years of operation, all indications were that this was a very well set-up venture though many including myself, were skeptical whether Superock KYOI could maintain the Japanese target audience by convincing them to stick to shortwave, and if not, how long would it be before advertisers “voted with their feet”? The first letters were read out within a month and the requests for assistance continued. In August 1986, the station indicated that US$20,000 was received in the appeal and at the same time, negotiations were under way to sell the station to the Christian Science Monitor. The purchase was announced on the 15th March 1987 with the change-over mid-July to late August with plans to add a second 100kW transmitter and adjustable antenna to cover Australia and New Zealand. The date was subsequently revised to January 4th 1988. It would appear that the Christian Science Monitor actually took over operation of KYOI in early 1988. The announced address changed to that of CSM in Boston though the station maintained the rock music format. In late March programming was changed slightly with the addition of a one-hour news program, with newscasts on the hour and half-hour from Boston then shortly thereafter another CSM production “Letterbox” was added. Transmissions under the call-letters KYOI ceased on the 3rd of July 1989. Over the next 4 months the transmitters were silent until the 6th of November 1989 when CSM’s station, Herald Broadcasting signed on with the call-letters KHBI. Author: Paul Ormandy with many thanks to Butch McBride , former Chief Engineer at KYOI. Just out of the blue I wrote “super rock kyoi” in Google and landed on radiodx.com which was very interesting. I was in Japan during the 80’s and learnt from somewhere about this station. I have no idea who mentioned it to me any longer. The second time we went to Saipan I hired a car after someone at the hotel mentioned the place Agingan Point. Said and done: We took the car and went down there and to my surprise there were no fences around the place, but on the other hand the engineer (?) on duty only looked out behind the curtain when I knocked on the door. The power station nearby roared at disco level and I am not sure if this was KYOI’s own power plant, or if it also served other facilities on the island. The enclosed picture was taken on the 26th December 1987. Unfortunately, I had left both the transistor radio and my KYOI T-shirt in Japan. And the Nissan we hired had only an AM Radio in it. In Japan I had built a converter for the AM Radio in my Honda Accord which provided the frequencies I used to listen to in the mornings and afternoons. The reception in Japan (Shizuoka City) was tremendous. After the 2:nd visit to Saipan I wrote about the guy behind the curtain, and I got a friendly letter in response to it saying that I was very welcome the next time I went to Saipan. Well, they did not make it and I never made it to Saipan a third time before returning to Europe. Anyway, I haven’t the faintest idea whether this was of any interest of all to you, but there you are. I was a keen Offshore Stations fan in the 60’s and I still am, only there are no more offshores around. Anyway, any you could receive in Switzerland. The upgrade of the KHBI station in 1988 after the purchase by Christian Science included a second 418D-2 transmitter, antennas for 270 and 195 degrees (4 X 4 X 0.35 using three self-supporting towers; you can see the 195 antenna on the QSL card on the web page), a dummy load and a switch matrix. Remote controls for slewing the antennas, controlling the switch matrix, and the transmitters were added. After the sale to Radio Free Asia, a third transmitter was added along with a diplexer for 11 and 9 MHz to feed the 340 degree antenna. The matrix was expanded from a 2 X 4 to a 3 X 5 configuration and a new matrix/slew control system was installed. After acceptance of the renovated station by RFA in September of 2000, title passed to IBB in November of 2000. During RFA’s ownership, CS programs continued to be aired. It is now known as “Saipan Transmitting Station.” It is under the same control as the Tinian Transmitting Station. As an IBB station, it carries both VOA and RFA programs as well as some paid non-government programming. Saipan was and is unusual in that the transmitters operate in a fully air-conditioned environment. In Tinian, for example, only the operator area and offices use chilled, de-humidified air. At the time KYOI was built on Saipan, there were two electrical rates: $5 for residences, $40 for businesses. When the Christian Science Church bought the station they had power meters installed and since Commonwealth Utilities did not have a seal, CS bought them one and had them use it. For the first time, CU calculated the cost of electricity: $.23/KWH. This brought the power bill for the station up to $38,000 per month. (It also prevented any scandal of “rich folks from Boston exploiting poor islanders.) The 418D-2 transmitters were converted to 418E’s in 1992 to use the Continental Electronics solid-state modulator. This modification and the ability to use variable carrier power (Controlled Carrier-Level Modulation, CCM) cut the bill to $23,000/month. Later, the Christian Science venture into television cost so much and brought such a howl of complaint from the membership that all operations were reviewed which resulted in the demise of Monitor Radio and the attempted sale of the shortwave stations in Cypress Spring, South Carolina and KHBI. The South Carolina station did not sell and is carrying paid broadcasts. Mention is made on the mosquito net about broadcasting from Saipan. The armed forces station (OWI) put on Saipan in 1944 (December) was a Western Electric 50 kW installed under the direction of J.O. Weldon, later of Weldon and Carr–who did the first curtain antenna in Greenville, NC in 1946–and founder of Continental Electronics (1946). CE’s first 1,000 kW transmitter was installed at Poro Point in the Philippines. Another was built for Bangkok and a third was split and each half operated at 500 kW from stations on Rhodes and at Kavala, Greece.